Gabe Maxfield never wanted to be a detective or a policeman or anything of the sort. The closest he wanted to come to the law was writing legal briefs and doing research for a big-shot law firm. Nice and safe, and without all the stress. No unanswered questions, just well-defined legal precedents. When he moves to Hawaii in the wake of a disastrous breakup and betrayal by an ex, a murder investigation is the last thing he expects to get wrapped up in, but he can’t help himself when a dead body, a hunky cop, and his best friend get involved. So much for sipping Mai Tais on the beach and admiring the well-tanned bodies around him. 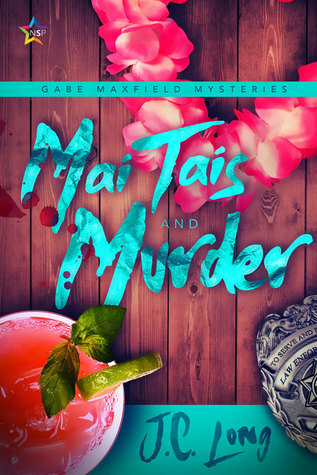 Mai Tais and Murder is the first book in the Gabe Maxfield Mysteries series. If this story is anything to go by I will have to keep my eyes open for the rest of the books. I really liked Gabe. He has a bit of the snark factor going for him which made me smile at times. He has recently gone through a rough break up and the only choice he saw for himself was to move to Hawaii where he will be closer to his best friend, Grace. It is through his friend, Grace which Gabe finds himself pulled into a murder. The other M/C in Mai Tais and Murder is Maka Kekoa. Maka is a detective with the police department. He is also Gabe’s new neighbor. While they had a brief introduction as Gabe was trying to talk to the movers, Max and Gabe are brought together again by the murder of Grace’s partner. While there is not the “love at first sight” feel to the book, there is an attraction between Gabe and Maka that grows as the story progresses. This ends up making things difficult for both men as Gabe is drawn increasingly into the murder investigation that Maka is officially involved in. I liked seeing these two try to figure out just want kind of relationship they are forming, as neither man is ready to admit they want to get involved in anything serious. Although I loved the romance aspect of this story, the mystery woven though out it is just as engaging. When Grace’s partner is found died, Grace becomes the suspect and Gabe goes out of his way to find out what is really going on. The author did a fantastic job holding my interest during the book and more than once I worried about how Gabe would react if Grace turned out to be the murder. I liked the little twists and turns and the fact that the author kept me guessing was a bonus. For me the story was wrapped up perfectly and I cannot wait to see what the rest of the series will look like. Christa Tomlinson has a new release, A Sniper’s Devotion! Check it out and enter to win a copy of her latest in the Cuffs, Collars and Love series!